The Neanderthal type of man prevailed in Europe at least for tens of thousands of years. For ages that make all history seem a thing of yesterday, these nearly human creatures prevailed. If the Heidelberg jaw was that of a Neanderthaler, and if there is no error in the estimate of the age of that jaw, then the Neanderthal Race lasted out for more than 200,000 years! Finally, between 40,000 and 25,000 years ago, as the Fourth Glacial Age softened towards more temperate conditions (see Figure 68: Europe and Western Asia in the Later Paleolithic Age), a different human type came upon the scene, and, it would seem, exterminated Homo Neanderthalensis. This new type was probably developed in South Asia or North Africa, or in lands now submerged in the Mediterranean basin, and, as more remains are collected and evidence accumulates, men will learn more of their early stages. At present we can only guess where and how through the slow ages, parallel with the Neanderthal cousin, these first true men arose out of some more ape-like progenitor. For hundreds of centuries they were acquiring skill of hand and limb, and power and bulk of brain, in that still unknown environment. They were already far above the Neanderthal level of achievement and intelligence, when first they come into our ken, and they had already split into two or more very distinctive races. These newcomers did not migrate into Europe in the strict sense of the word, but rather, as century by century the climate ameliorated, they followed the food and plants to which they were accustomed, as those spread into the new realms that opened to them. The ice was receding, vegetation was increasing, big game of all sorts was becoming more abundant. Steppe like conditions, conditions of pasture and shrub, were bringing with them vast herds of wild horse. Ethnologists (students of race) class these new human races in one same species as ourselves, and with all human races subsequent to them, under one common specific name of Homo sapiens. They had quite human brain cases and hands. Their teeth and their necks were anatomically as ours are. We know of two distinct sorts of skeletal remains in this period, the first of these known as the Cro-Magnon race, and the second the Grimaldi race; but the great bulk of the human traces and appliances we find are either without human bones or with insufficient bones for us to define their associated physical type. There may have been many more distinct races than these two. There may have been intermediate types. In the grotto of Cro-Magnon it was that complete skeletons of one main type of these Newer Paleolithic men, these true men, were first found, and so it is that they are, spoken of as Cro-Magnards. 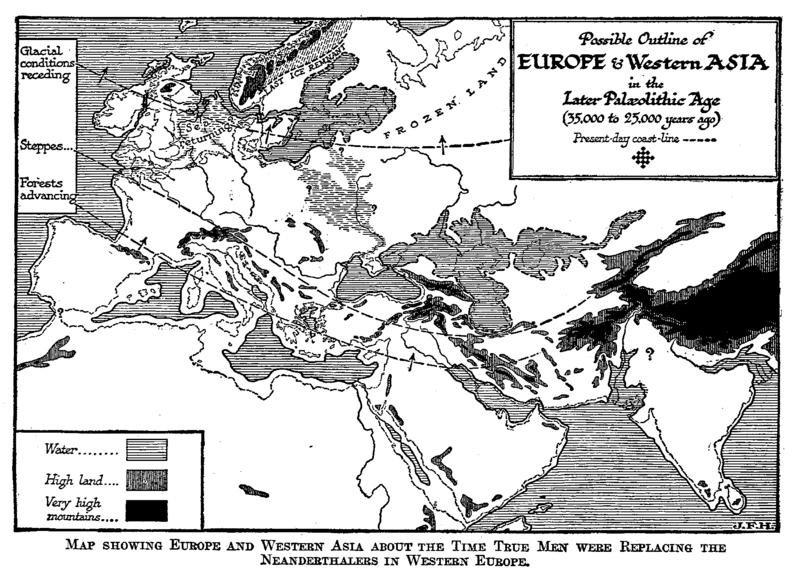 Map showing Europe and Western Asia about the time true men were replacing the Neanderthalers in Western Europe. These Cro-Magnards were a tall people with very broad faces, prominent noses, and all things considered, astonishingly big brains. The brain capacity of the woman in the Cro-Magnon cave exceeded that of the average male today. Her head had been smashed by a heavy blow. There were also in the same cave with her the complete skeleton of an older man, nearly six feet high, the fragments of a child’s skeleton, and the skeletons of two young men. There were also flint implements and perforated sea-shells, used no doubt as ornaments. Such is one sample of the earliest true men. But at the Grimaldi cave, near Mentone, were discovered two skeletons also of the later Paleolithic Period, but of a widely contrasted type, with Negroid characteristics that point rather to the Negroid type. There can be no doubt that we have to deal in this period with at least two, and probably more, highly divergent races of true men. 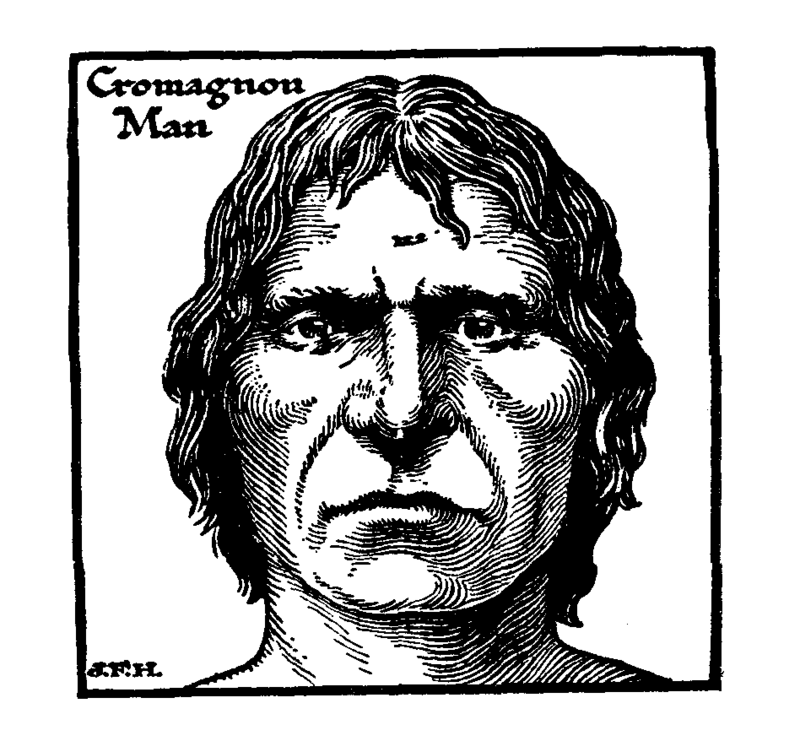 They may have overlapped in time, or Cro- Magnards may have followed the Grimaldi race, and either or both may have been contemporary with the late Neanderthal men. Various authorities have very strong opinions upon these points, but they are, at most, opinions. The appearance of these truly human postglacial Paleolithic peoples was certainly an enormous leap forward in the history of mankind. Both of these main races had a human fore-brain, a human hand, an intelligence very like our own. They dispossessed Homo Neanderthalensis from his caverns and his stone quarries. And they agreed with modern ethnologists, it would seem, in regarding him as a different species. Unlike most savage conquerors, who take the women of the defeated side for their own and interbreed with them, it would seem that the true men would have nothing to do with the Neanderthal race, women or men. There is no trace of any intermixture between the races, in spite of the fact that the newcomers, being also flint users, were establishing themselves in the very same spots that their predecessors had occupied. We know nothing of the appearance of the Neanderthal man, but this absence of intermixture seems to suggest an extreme hairiness, an ugliness, or a repulsive strangeness in his appearance over and above his low forehead, his beetle brows, his ape neck, and his inferior stature. Or he?and she?may have been too fierce to tame. Says Sir Harry Johnston, in a survey of the rise of modern man in his Views and Reviews: ?The dim racial remembrance of such gorilla-like monsters, with cunning brains, shambling gait, hairy bodies, strong teeth, and possibly cannibalistic tendencies, may he the germ of the ogre in folklore…?. These true men of the Paleolithic Age, who replaced the Neanderthalers, were coming into a milder climate, and although they used the caves and shelters of their predecessors, they lived largely in the open. They were hunting peoples, and some or all of them appear to have hunted the mammoth and the wild horse as well as the reindeer, bison, and aurochs. They ate much horse. At a great open-air camp at Solutre, where they seem to have had annual gatherings for many centuries, it is estimated that there are the bones of 100,000 horses, besides reindeer, mammoth, and bison bones. They probably followed herds of horses, the little bearded ponies of that age, as these moved after pasture. They hung about on the flanks of the herd, and became very wise about its habits and disposition. A large part of these men’s lives must have been spent in watching animals. Whether they tamed and domesticated the horse is still an open question. Perhaps they learnt to do so by degrees as the centuries passed. At any rate, we find late Paleolithic drawings of horses with marks about the heads that are strongly suggestive of bridles, and there exists a carving of a horse’s head showing what is perhaps a rope of twisted skin or tendon. But even if they tamed the horse, it is still more doubtful whether they rode it or had much use for it when it was tamed. The horse they knew was a wild pony with a beard under its chin, not up to carrying a man for any distance. It is improbable that these men had yet learnt the rather unnatural use of animal’s milk as food. If they tamed the horse at last, it was the only animal they seem to have tamed. They had no dogs, and they had little to do with any sort of domesticated sheep or cattle. It greatly aids us to realize their common humanity that these earliest true men could draw. Both races, it would seem, drew astonishingly well. They were by all standards savages, but they were artistic savages. They drew better than any of their successors down to the beginnings of history. They drew and painted on the cliffs, and cave walls that they had wrested from the Neanderthal men. And the surviving drawings come to the ethnologist, puzzling over bones and scraps, with the effect of a plain message shining through guesswork and darkness. They drew on bones and antlers; they carved little figures. These later Paleolithic people not only drew remarkably well for our information, and with an increasing skill as the centuries passed, but they have also left us other information about their lives in their graves. They buried. They buried their dead, often with ornaments, weapons, and food; they used a lot of colour in the burial, and evidently painted the body. From that one may infer that they painted their bodies during life. Paint was a big fact in their lives. They were inveterate painters; they used black, brown, red, yellow, and white pigments, and the pigments they used endure to this day in the eaves of France and Spain. Of all modern races, none have shown so pictorial a disposition; the nearest approach to it has been among the American Indians. These drawings and paintings of the later Paleolithic people went on through a long period of time, and present wide fluctuations in artistic merit. 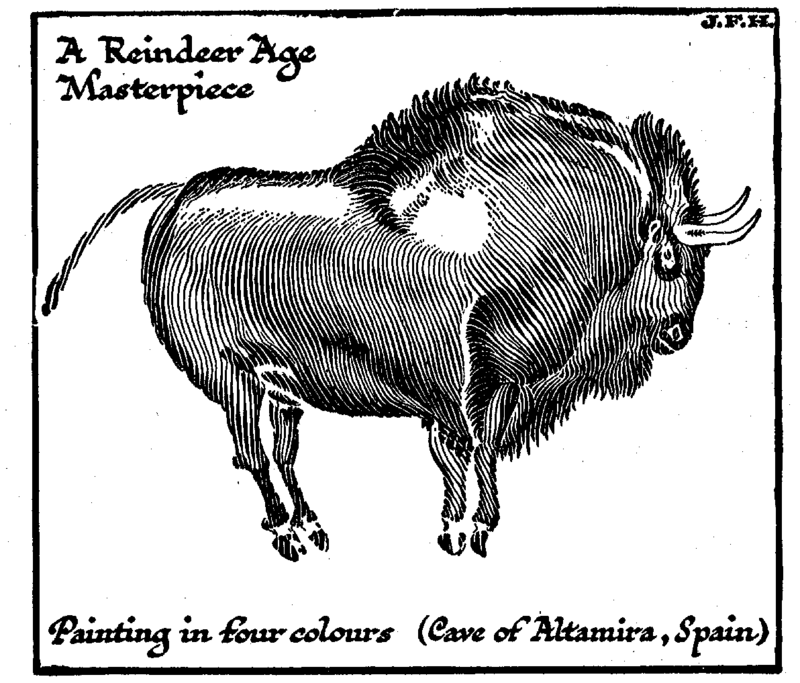 We give here some early sketches, from which we learn of the interest taken by these early men in the bison, horse, ibex, cave bear, and reindeer. In its early stages the drawing is often primitive like the drawing of clever children; quadrupeds are usually drawn with one hind-leg and one fore-leg, as children draw them to this day. The legs on the other side were too much for the artist’s technique. Possibly the first drawings began as children’s drawings begin, out of idle scratchings. The savage scratched with a flint on a smooth rock surface, and was reminded of some line or gesture. But their solid carvings are at least as old as their first pictures. The earlier drawings betray a complete incapacity to group animals. As the centuries progressed, more skillful artists appeared. The representation of beasts became at last astonishingly vivid and like. But even at the crest of their artistic time they still drew in profile as children do; perspective and the fore-shortening needed for back and front views were too much for them. They rarely drew themselves. The vast majority of their drawings represent animals. The mammoth and the horse are among the commonest themes. Some of the people, whether Grimaldi people or Cro-Magnon people, also made little ivory and soapstone statuettes, and among these are some very fat female figures. These latter suggest the physique of Grimaldi rather than of Cro- Magnon artists. They are like Bushmen women. The human sculpture of the earlier times inclined to caricature, and generally such human figures as they represent are far below the animal studies in vigour and veracity. Later on there was more grace and less coarseness in the human representations. One little ivory head discovered is that of a girl with an elaborate coiffure. These people at a later stage also scratched and engraved designs on ivory and bone. Some of the most interesting groups of figures are carved, very curiously round bone, and especially round rods of deer bone, so that it is impossible to see the entire design altogether. Figures have also been found modelled in clay, although no Paleolithic people made any use of pottery. Many of the paintings are found in the depths of unlit caves. They are often difficult of access. The artists must have employed lamps to do their work, and shallow soapstone lamps in which fat could have been burnt have been found. Whether the seeing of these cavern paintings was in some way ceremonial or under what circumstances they were seen, we are now altogether at a loss to imagine. At last it would seem that circumstances began to turn altogether against these hunting Newer Paleolithic people who had flourished for so long in Europe. They disappeared. New kinds of men appeared in Europe, replacing them. 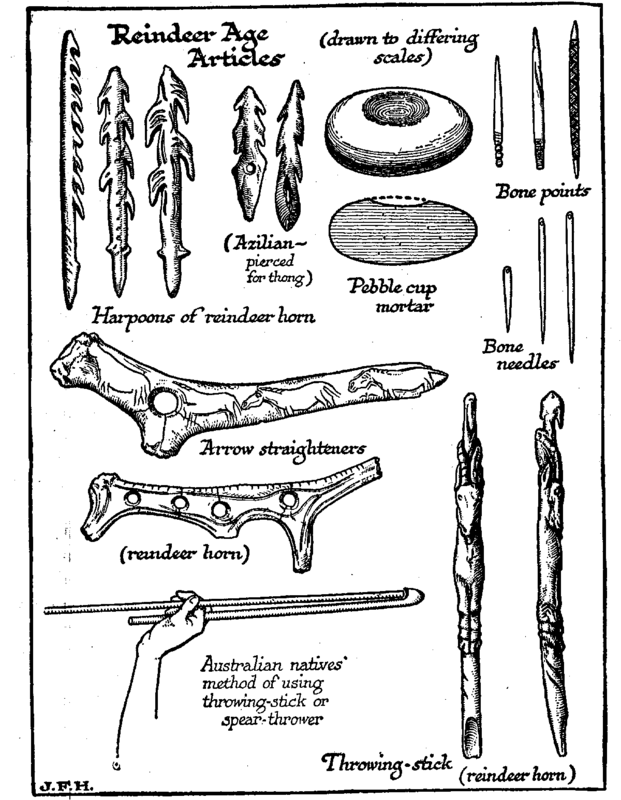 These latter seem to have brought in bow and arrows; they had domesticated animals and cultivated the soil. A new way of living, the Neolithic way of living, spread over the European area; and the life of the Reindeer Age and of the races, of Reindeer men, the Later Paleolithic men, after a reign vastly greater than the time between ourselves and the very earliest beginnings of recorded history, passed off the European stage. The opinion that the Neanderthal race (Homo Neanderthalensis) is an extinct species which did not interbreed with the true men (Homo sapiens) is held by Professor Osborn, and it is the view to which the writer inclines and to which he has pointed in the treatment of this section; but it is only fair to the reader to note that many writers do not share this view. They write and speak of living “Neanderthalers” in contemporary populations. One observer has written in the past of such types in the west of Ireland; another has observed them in Greece. These so-called “living Neanderthalers” have neither the peculiarities of neck, thumb, nor teeth that distinguish the Neanderthal race of pre-men. The cheek teeth of true men, for instance, have what we call fangs, long fangs; the Neanderthaler?s cheek tooth is a more complicated and specialized cheek tooth, a long tooth with short fangs, and his canine teeth were less marked, less like dog-teeth, than ours. Nothing could show more clearly that he was on a different line of development. We must remember that so far only western Europe has been properly explored for Paleolithic remains, and that practically all we know of the Neanderthal species comes from that area (see Map, p. 56). No doubt the ancestor of Homo sapiens (which species includes the Tasmanians) was a very similar and parallel creature to Homo neanderthalensis. And we are not so far from that ancestor as to have eliminated not indeed “Neanderthal”, but “Neanderthaloid” types. The existence of such types no more proves that the Neanderthal species, the makers of the Chellean and Mousterian implements, interbred with Homo sapiens in the European area than do monkey-faced people testify to an interbreeding with monkeys; or people with faces like horses, that there is an equine strain in our population.